Green manuring is defined as the growing of green manure crops & then turning off these crops directly in the field by ploughing the field so as to make the field richer in nitrogen which is the most deficient nutrient of the soil. Green manuring crops help in improving the structure of soil & also increases its physical properties. One of the main objectives of the green manuring is to increase the content of nitrogen in the soil to increase the crop production. The green manuring can be practised as in-situ or green leaf manuring. Green in-situ manuring refers to the growing of green manuring crops in the border rows or as intercrops along with the main crops for example: Sunn hemp, Cowpea, Dhaincha, Berseem, Green gram etc. whereas green leaf manuring is the collection of green leaves from outside places such as waste or forestlands; for example collection of wild dhaincha leaves & then incorporating them into the crop field for improving the soil properties. 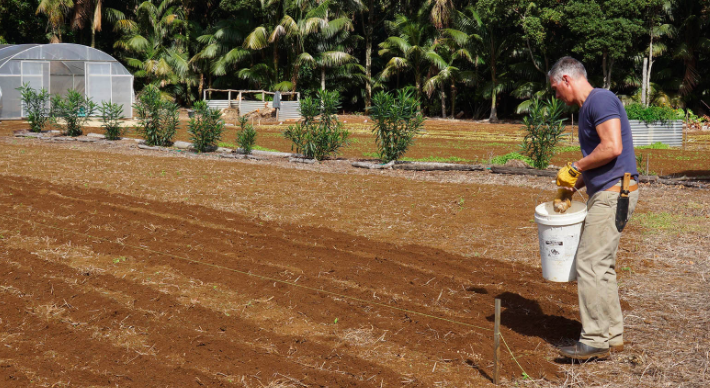 Most of the green manuring crops are incorporated in the fields after 6 to 8 weeks of sowing with the application of water so that they should be easily incorporated into the soil. The flowering stage of the green manuring crops is the best time for incorporation of these crops. It will lead in building the soil structure & improving the soil physical properties like soil aeration, water holding capacity of the soil, soil bulk density etc. This will also help in bringing the nutrients into the upper layers so that they should become available for the plant absorption from the lower layers. 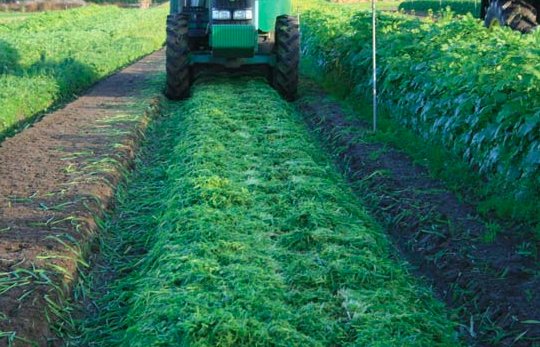 Green manuring also fulfils the crops need of nitrogen which is the most deficient nutrient in the soil these days. It will also increase the soil availability of different micro and macronutrient like those of calcium, phosphorus, potash, magnesium etc. Crotolaria juncea (or Sunnhemp): it is a green manuring crop with vigorous cropping habits & it does not withstand the waterlogging. Its seed rate is 25 -30 kg. per hectare. It is incorporated into the soil after a period of 9 or 10 weeks of sowing. The quantity of nitrogen fixed by this crop is very good i.e.80 to 130 kg/ha. It contains about 2.80 to 3.15 % nitrogen content percent. Sesbania aculeate (Daincha): It is a quick growing succulent crop which can be grown in any conditions of soil & climate. It can be incorporated into the soil after 8 to 10 weeks after sowing & its recommended seed rate is 20 to 25 kg/ha. The quantity of nitrogen fixed by this crop is 130 to 18 5 kg/ha & N content in it is 2.55 to 3.21 %. Sesbania rostrata : It is different from S.acumeate in the sense that it has nodules on both stem & root. It grows well under waterlogged conditions. It’s recommended seed rate is 35 to 40 kg/ha & the seed should be sown after treating it with sulphuric acid for 15 minutes for effective germination. It can fix a nitrogen dose of 170 to 220 kg/ha within a period of 8 to 10 weeks in soil & contains 3.20 to 3.37 % N content. Sesbania species: It is another species of daincha which is also a good green manuring crop. It fixes 115 to 160 kg nitrogen/ha in the soil & contains 2.29 to 3.1 % N content in it. Tephrpsia purpurea (Wild indigo): it is a slow growing green manure crop which is not eaten by cattle & it does not withstand waterlogging conditions for a long time. Due to these reasons, it is most suitable for light soils green manuring. It’s effective seed rate is 20 to 25 kg/ha & it fixes nitrogen @ 70 to 115 kg/ha. It contains 2.90 to 3.22 % N content. Glyricidia maculata: It is a shrub which grows tall & used as green leaf manure in the field. It can be kept low by topping or pruning at a height of 2 to 3 meters from the ground as it has a tall tree like growing habits. It requires 2 to 3 annual pruning & can give 5 to 10 kg leaves/plant annually after 2 years of growth. It contains 2.25 to 2.76 % N content. Cassia pistula: It is a weed which is used for green manuring. It contains 0.75 to 1.22 % nitrogen content in it. Its stems & leaves are used for green manuring when the plant is in the flowering stage. Cowpea or Vigna sinensis: It fixes about 200 kg nitrogen/ha in soil due to symbiotic nitrogen fixation by Rhizobium. Green gram or Vigna radiata: It fixes about 220 kg nitrogen/ ha in the soil which is very high in regards that you can also obtain a good production of a green gram as well. Some of the other legume green manuring crops are Soybean, Alfa-Alfa, Clusterbean etc. which also fixes effective nitrogen from the atmosphere into the soil by the process of symbiotic nitrogen fixation by a bacterium named Rhizobium.